Other walking magazines and web sites bring you gear reviews of poles, boots, and clothing. We go straight to the thing that matters: food and specifically Kendal Mint Cake. Kendal Mint Cake is essentially a way of delivering glucose for an immediate hit of energy, followed by sugar which is processed quite quickly into glucose! Mint cake comes in two basic sorts: white and brown, based on whether it's made with refined or unrefined sugar. This time round we're sampling brown mint cake although one white bar did creep in. 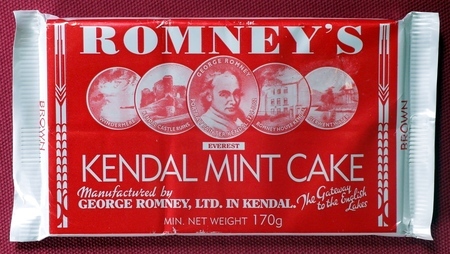 Romney's Brown - Romney's is possibly the most commonly found Kendal Mint Cake outside the Lake District, both brown in the red packaging and white in blue packaging. They're very proud that their cake was carried on the first successful trip to the summit of Everest, something you can read about on the back of every packet. We found Romney's Brown had a fine grain. It was soft and sticky with a hint of honey and of all of the samples we tried this was the one with the least peppermint flavour. 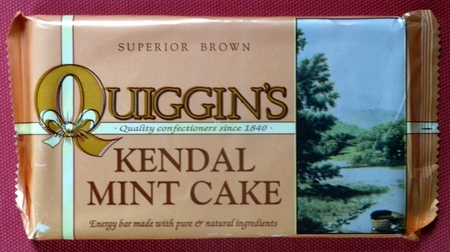 Quiggin's Superior Brown - Quiggins have been making Kendal Mint cake since 1880 which they say is longer than any other company still in existence so they believe that they are the home of Kendal Mint Cake. Quiggin's Brown was noticeably darker than the other samples we tried. It was very crisp but melted easily in the mouth and had a strong peppermint flavour. 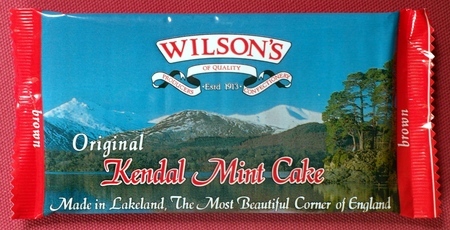 Wilson's Brown - Wilsons (aka the Creative Confectionery Company) have been making Kendal Mint Cake for over eighty years since James Wilson first went into business at the New York Inn in Kendal. Now located at Cross Lane, Kendal the cake is still made in exactly the same way as it was nearly 100 years ago, stirring the sugar by hand in copper pans. We got the very slightest hint of oranges from Wilson's Brown which was firm, although not as firm as Quiggin's, while being soft while not soft as Romney's, a combination which together with just the right amount of peppermint makes this our favourite brown Kendal Mint Cake. Wiper's - this is actually made by Romneys who bought the name from the Wiper family. 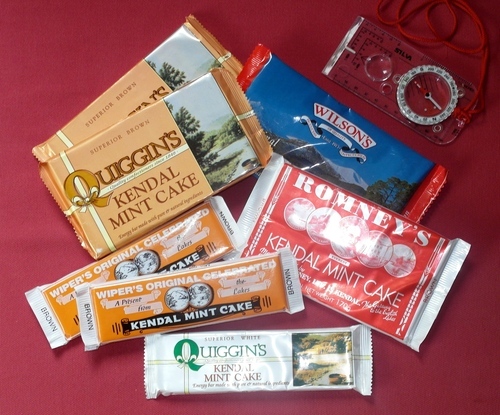 Their web site claims that Joseph Wiper is the man who invented Kendal Mint Cake in the first place. Despite that this is a very different product to Romney's own brand: hard and crispy, with a strong peppermint flavour. Do you agree with our reviews? If not then why not let us know in the forum?